Sergeants D-Day is Sergeants with all the richness of the soldiers, story and tactics, however the scale is slightly different from our SMG games. 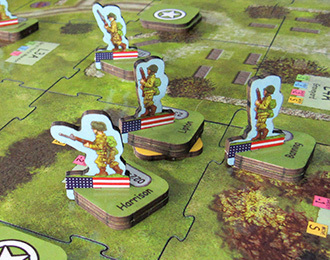 In Sergeants D-Day the time scale is just a little longer, the movement more sweeping, allowing you to determine the approach to the moment of decision. 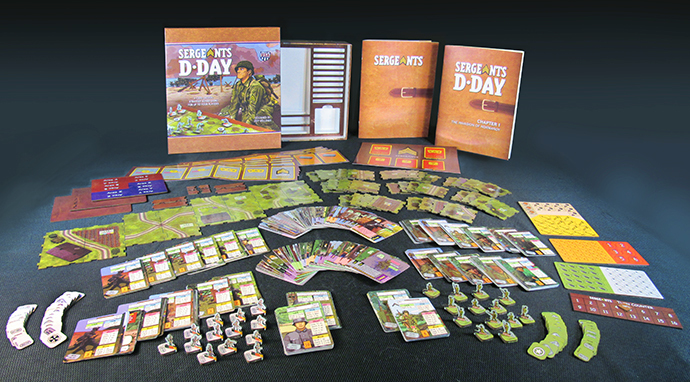 Because Sergeants D-Day plays quicker and covers more ground while maintaining the skirmish point of view of the battlefield, you can lead full squads of troops and join with your friends to play combats in battles as large as platoon against platoon, all in an easy to play fast paced format. "Your Squad Your Way" is what you can expect right out of the box. Sergeants always has unique soldiers where no two of them are alike. Not only in name and serial number, but mannerisms, skills and abilities... made even richer with courage and faults all expressed in the form of the soldiers cards. In your starter set of Sergeants D-Day you get 20 unique soldiers with and additional six core characters. The 13 man US Airborne and German Light Infantry squads include machine guns and other equipment. Enough right in the base game to let you play a reinforced squad against one of your friends; or play a short squad with one friend against two other friends playing the opposing force.